The recommendation of products, content and services cannot be considered newly born, although its widespread application is still in full swing. While its growing success in numerous sectors, the progress of the Social Web has revolutionized the architecture of participation and relationship in the Web, making it necessary to restate recommendation and reconciling it with Collaborative Tagging, as the popularization of authoring in the Web, and Social Networking, as the translation of personal relationships to the Web. 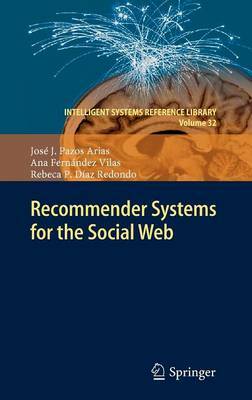 Precisely, the convergence of recommendation with the above Social Web pillars is what motivates this book, which has collected contributions from well-known experts in the academy and the industry to provide a broader view of the problems that Social Recommenders might face with. If recommender systems have proven their key role in facilitating the user access to resources on the Web, when sharing resources has become social, it is natural for recommendation strategies in the Social Web era take into account the users' point of view and the relationships among users to calculate their predictions. This book aims to help readers to discover and understand the interplay among legal issues such as privacy; technical aspects such as interoperability and scalability; and social aspects such as the influence of affinity, trust, reputation and likeness, when the goal is to offer recommendations that are truly useful to both the user and the provider.